Welcome to King's Fork, Home of the Bulldogs! Our school colors are Maroon and Vegas Gold. King's Fork was founded in 2003, and was designed by the architectural firm of Ripley Rodriguez Maddox Motley. Students at King's Fork High are drawn from the Northwestern quadrants of the city, including the King's Fork area, Crittenden, and Hobson. Students are also drawn from the southern Nansemond Parkway/Wilroy Road area, and shares downtown neighborhoods with Lakeland High School. Each house contains space for an assistant principal, guidance counselor, teacher work areas, general classrooms, science labs, and resource spaces in addition to two to three specialized career/technical subjects. A guidance suite is located opposite the main office and is accessible upon entering the school. There are science labs located in each hall able to accommodate all sciences except Chemistry which has a specialized lab. Each pair of science lecture spaces shares a wet lab and preparation partitions. Specialty subjects such as Agriculture, Work/Family Studies, Health, JROTC, and Liberal Arts that are not suited for location within houses are properly placed according to need and required access. Instructional areas typically share a small computer lab. The curriculum at KF is both unique and challenging. King's Fork High School offers an extensive range of courses at core, honors, International Baccalaureate and Advanced Placement levels, in addition to various dual enrollment classes offered through the Hobbs campus of Paul D. Camp Community College, also located in Suffolk, and through Tidewater Community College. 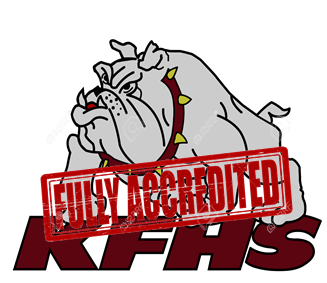 In addition to academic courses, King's Fork High offers a range of agricultural and resource management courses. In addition to a challenging curriculum, King's Fork offers students an an opportunity participate in many extra-curricular activities. In 2009 our boys' basketball team came home with the VHSL AAA state title and in 2017 our girls' basketball team advanced to the state arena and finished as AAA state runner-ups. We have state champions in track and wrestling. In 2017 our football team finished as Southeastern District champions and regional runner-ups. All of our teams are highly competitive in the Southeastern District. We also offer a wide range of non-athletic events including drama, debate, ecology, scholastic bowl and many others.